BOOK EXPO 2017: Meeting some awesome authors! 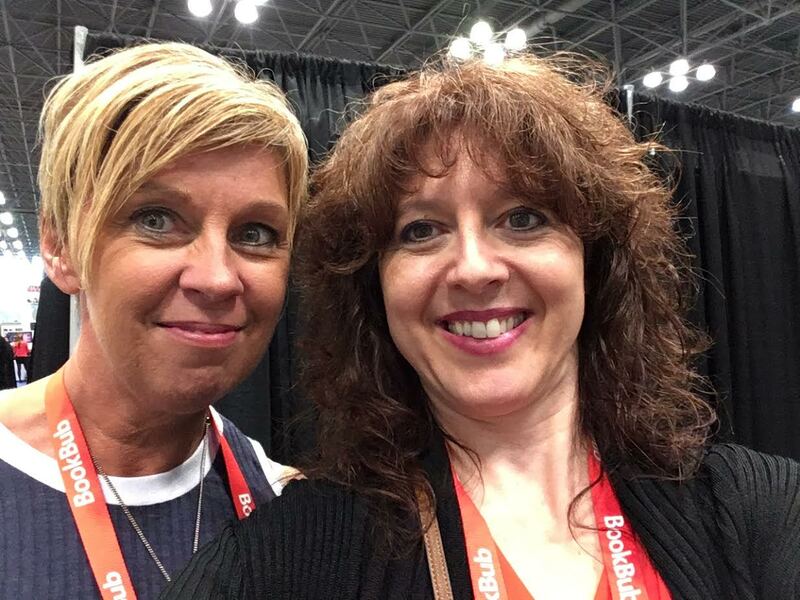 Yesterday I posted about my impressions of BookExpo 2017 and some of the changes I saw. 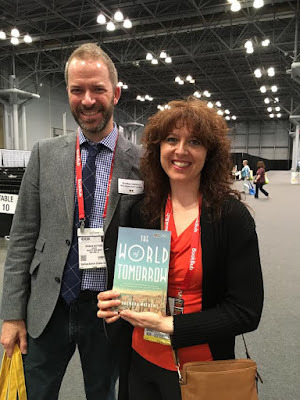 One of the best things about BookExpo is meeting favorite authors. And this year I saw Adriana Trigiani again who recently published Kiss Carlo, which I'll be reading this month. She is one of the kindest authors I've met. She has a knack for making you feel special. She is beloved by her fans because she acknowledges them and gives of her time. No haughty airs from this woman. I just LOVE that about her! 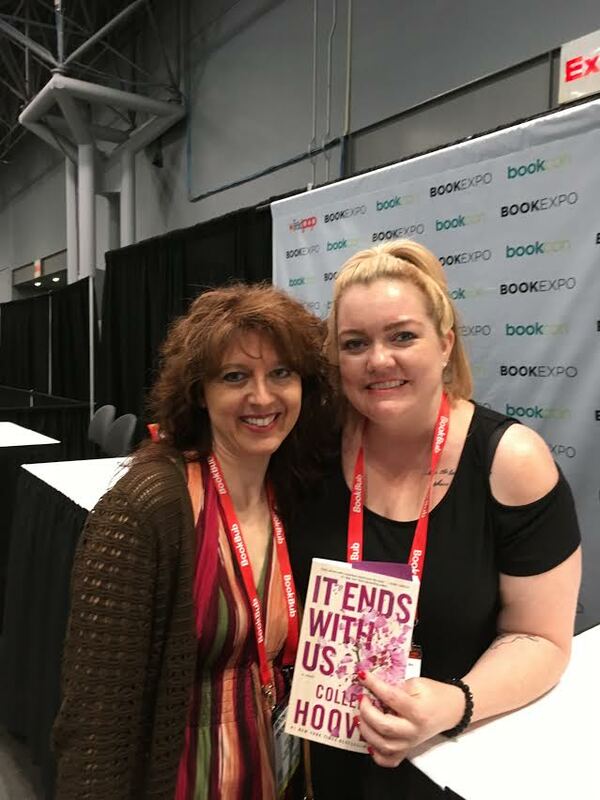 I also got a chance to meet Colleen Hoover, who was signing copies of It Ends With Us. I remember reading Hoover's first book Slammed which was originally self-published and later picked up by Atria. 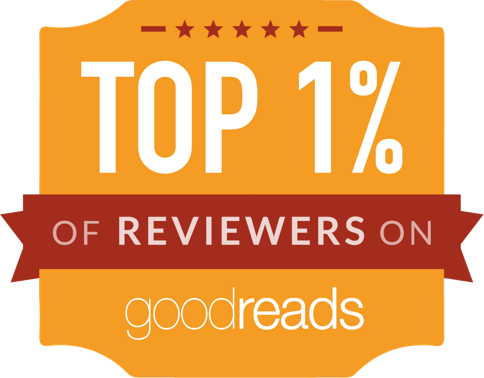 She is the success story of a self-published author who reached #1 on The New York Times without the help of any publishing house. 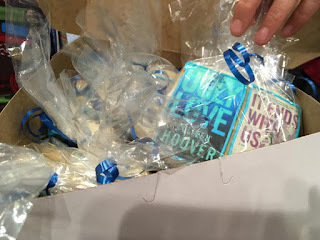 A fan gifted Hoover with mini cakes decorated with the book covers of all of Hoover's eleven books. What an original idea for a gift! 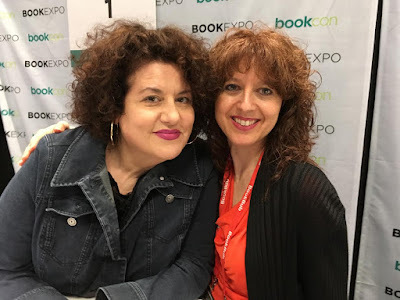 By chance I met the lovely Laura Morelli who stopped by for the day. She spotted me speaking with an author and came to greet me. Laura Morelli is the author of The Gondola Maker and the upcoming title The Painter's Apprentice: A Novel of 16th-Century Venice, which I can't wait to read! I also met two authors whose books were highlighted by their publishers on Friday during the Book Group Speed Dating session. 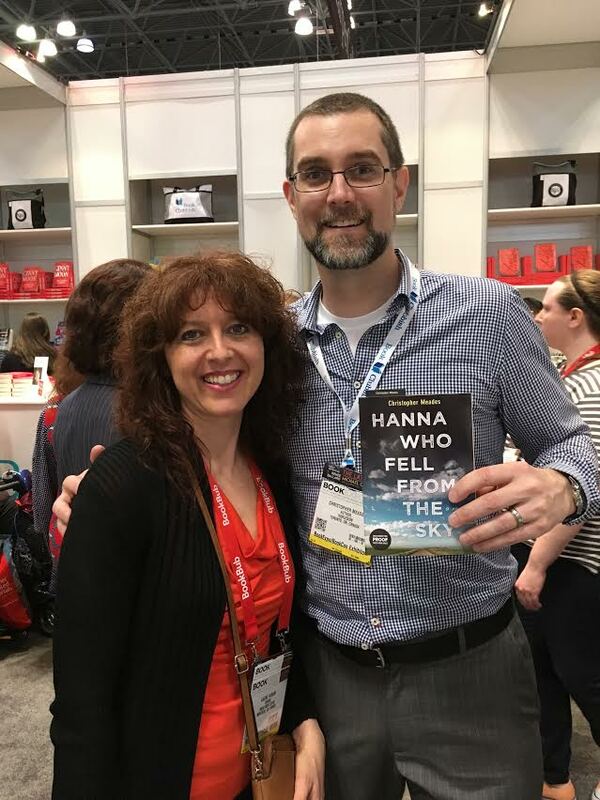 Canadian author Christopher Meades, who wrote Hanna Who Fell from the Sky, was super friendly as he took the time to talk to me about his book. 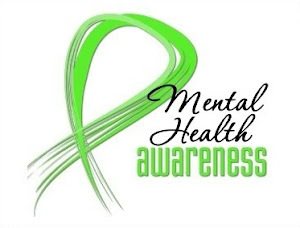 I was fascinated by his story of how he had suffered a traumatic brain injury while playing hockey and later managed to write the manuscript one hour at a time. 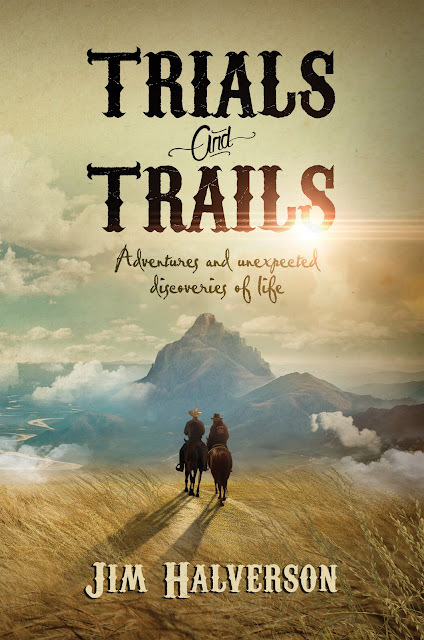 Writing the novel was therapeutic and a dream come true for this author. I also met Brendan Mathews, author of The World of Tomorrow, historical fiction that is already causing a buzz and is considered a tour de force. He took the time to tell me how he researched his novel. He was kind and friendly as he chatted with me after his signing was over. I actually snagged the last copy and was happy I did! I met a few book bloggers who I've known for years such as Sheila deChantal (BookJourney) and Tamara Welch (Traveling with T) but for the most part I mainly met with authors and publishers, especially since I was networking for iRead Book Tours. I missed Book Expo last year when it was in Chicago and I'm happy it's back in New York. I look forward to attending once again in 2018! 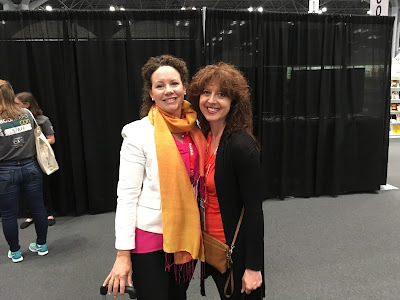 Meeting authors is the best and I agree 100% about Adriana Trigiani - she is a gem of a person! Trigiani, Tamara and Sheila!! Sounds like a great time all around. I did have a wonderful time. 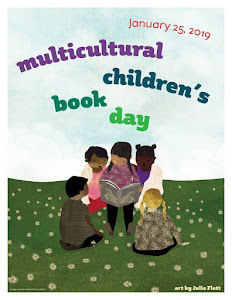 Looking forward to doing it again next year!